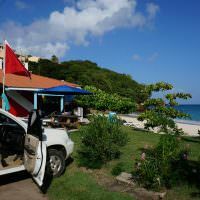 Grenada is so much more than beautiful white sand beaches, hidden coves and rocky points. Deep in the jungle-clad, mountainous interior of the island, there are dozens of treks, summits and waterfalls just waiting to be discovered. Visiting the waterfalls is one of the top things to do in Grenada. The area around Grand Etang National Park is famous for having some of the best day hikes on the island. 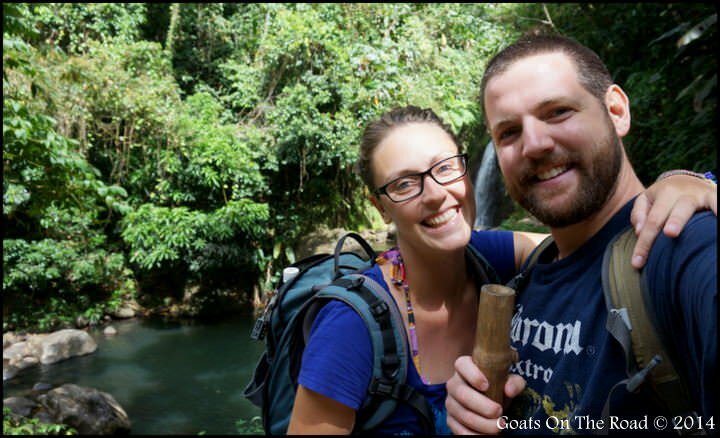 So, we decided that our first hike in Grenada would be to the Seven Sisters Waterfall! 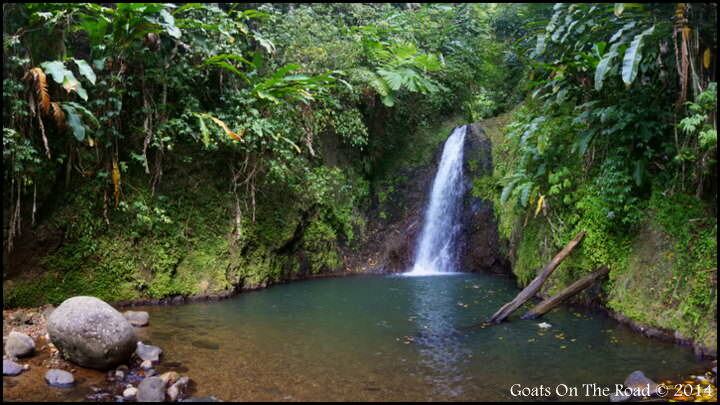 Also known as St. Margaret’s Falls, these tumbling waters are nestled deep in the high elevation rainforest right in the center of Grenada. Surrounded by private nutmeg and cocoa plantations, this was the perfect place to lace up our hiking shoes and hit the trails. We brought Spare, the dog we are currently pet sitting, along for the ride too! The hike itself was relatively easy, taking us just 20 – 30 minutes each way. 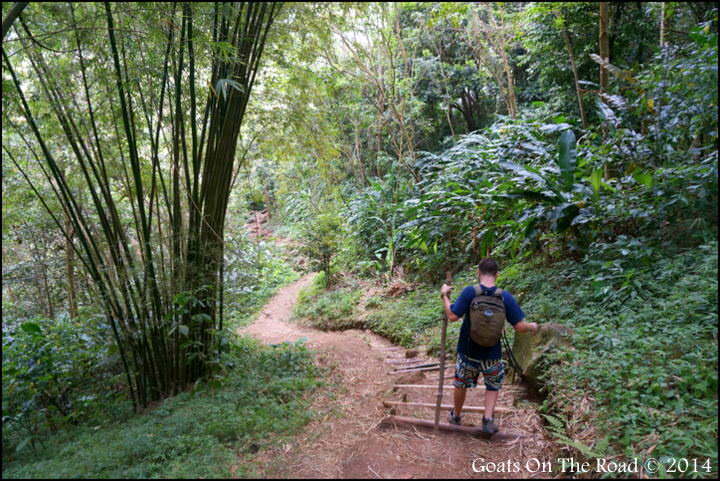 There was a steep descent down to the falls and we followed a natural staircase made from rocks and bamboo sticks. Once we reached the falls we could see why this hike is such a popular one. Despite the fact that it was the weekend, and this is one of the more desirable hikes in Grenada, we were still the only people at the falls. We swam and hung out around the crystal clear pools before heading back up to the car and driving home. *Update, 2017: Although this hike and the falls are still beautiful, a new zipline has been built here, which takes away from the peacefulness of the area. Check Out Our Quick Video Of These Beautiful Falls! 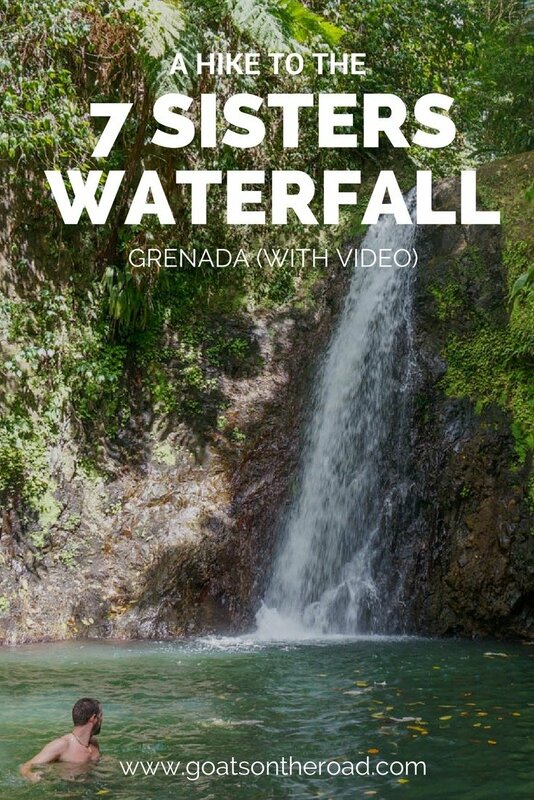 7 Sisters Waterfall is an easy day trip from St.George’s in Grenada. Just 40 minutes from the capital, visitors can reach the entrance to the trailhead by rented car, local minivan, or organized tour from St. George’s. The falls are a great place to relax and cool down while being completely surrounded by a lush, tropical rainforest. Thanks Anna 🙂 We loved making it! With a cool pool to swim in after and beautiful forest scenery – what’s not to like about this hike! Looks great! Bet Spare enjoyed it too :-). He did! haha, he wouldn’t swim, but he loved cooling off his paws in the shallow waters. Wow, that looks so beautiful, and so refreshing after a long hike 🙂 Loved the video! You guys are such a inspiration for us 🙂 Keep up the good work! Thanks so much for the kind words you two 🙂 Happy travels to you! I had no idea there were some hiking spots in Grenada! Hiking is one of my favorite things to do, but I often have trouble giving up the beach when I travel. I love finding places where you can get a good mix! 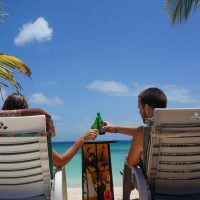 Grenada has a wonderful mix of hiking/trekking and lazing on beaches. There’s sooo much to do here! If it were only beaches, I think I’d be bored – can only lay out in the sun for so long haha. Awesome video! Looks like a really beautiful place to visit. And what a fun walk for Spare. Cool! Thanks! It was a great walk…and yes, Spare loved it! A hidden gem in the jungle! How lovely!! Thanks for sharing!! Loved my first visit to Grenada this spring but admit I fell under the spell of the beautiful swimmable beaches and spent most of my time under the palms there. Will def go back and your post has inspired me to hike to the falls. I was warned it was tough in the heat but from your pics and description, I ‘ll be up for it. Great post! I can’t blame you, the beaches in Grenada are amazing! The walk to the falls is quite shady and even though it’s hot, you get to swim at the end of the walk…which is only about 20 mins or a bit more 🙂 Next time!